Bowers and Merena Auctions realized more than $6.2 million as Official Auctioneer of the Baltimore Coin and Currency Convention. Highlights include the sale of an exceptional 1801 Capped Bust Right Eagle in PCGS MS-64 and Fr. 114 1901 $10 Legal Tender Note S/N 1, PCGS Very Fine 30PPQ. IRVINE, Calif. – Bowers and Merena Auctions, America’s leading rare coin auction house, posted another highly successful outing in Baltimore as Official Auctioneer of the Baltimore Coin and Currency Convention. More than 3,000 lots crossed the block in three sessions June 5-6, 2008, realizing $6,258,873. "The June Baltimore Coin and Currency Convention is the kick-off to the summer show season and we were very pleased with the attendance at the show and our three sessions of live bidding. Bidding was very active for coins as well as currency and we are happy with the results," said Steve Deeds, president of Bowers and Merena. "All three sessions were very busy and we were glad to see many bidders join us for their very first auctions, alongside our regular bidders that we look forward to seeing each time we come to Baltimore. The atmosphere in the auction room and on the bourse floor was lively and enthusiastic and I am looking forward to what the rest of the summer season brings." Highlights from the June Baltimore auction include the sale of Lot 3733, an 1801 Capped Bust Right Eagle, BD-2, HBCC-3194, Taraszka-25, Rarity-2 in PCGS MS-64 that realized $111,550, an impressive near-Gem considered a glorious representative of the Large Eagle Capped Bust Right Ten. Another extraordinary highlight came from the currency session, Lot 2537, a Fr. 114, 1901 $10 Legal Tender Note S/N 1, PCGS Very Fine 30PPQ, that realized a remarkable $80,500. The historical importance of this note goes without saying, as it is the first 1901 $10 Legal Tender Note to have ever been printed, and it is the first of the nine Friedberg numbers assigned to this design type. Prices realized for all lots in the Bowers and Merena Official Auction of the June Baltimore Coin and Currency Convention are available online at www.bowersandmerena.com. This is the second of three Baltimore auctions by Bowers and Merena in 2008, continuing their longstanding and ongoing association with the convention – the next is scheduled for November 19-23. 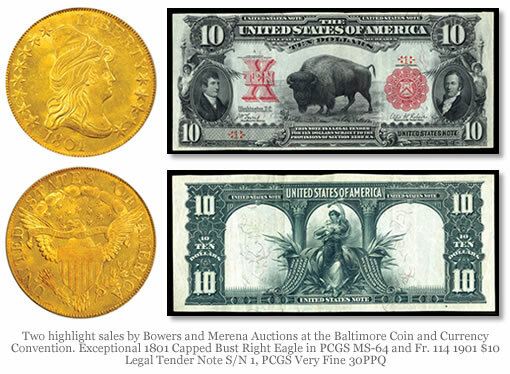 Bowers and Merena will conduct its Baltimore Rarities Sale at the Marriott Waterfront on July 26 prior to the ANA World’s Fair of Money. Bowers and Merena Auctions was founded in 1983 and has grown to become the world’s preeminent numismatic auctioneer with more than half a billion dollars in rare coin and currency sales. Bowers and Merena has handled four of the five most valuable United States coin collections ever sold, including the Louis E. Eliasberg Sr. Collection, the Harry W. Bass Jr. Collection, the Garrett Collection for The Johns Hopkins University, and the Norweb Collection.